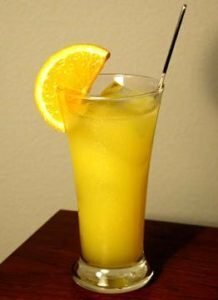 Developed back in the mid 1960’s, the Freddy Fudpucker is essentially a Harvey Wallbanger with a decent tequila instead of vodka. This cocktail may have arisen with a massive influx of tequila to the American markets, or just because a lonely bartender ran low on vodka and had to start moving some of the extra agave-based spirit that was sitting in the back of the storeroom. The tequila adds a different flavour to the beverage, similar to tequila in a mixed with a spicy ginger beer to make the El Diablo. We cover all things Tequila on Day #5. This cocktail might be for the more adventurous tasters out there. Of course there are a few of you that might just order a mixed drink such as this simply for the name. Creative cocktail naming is essential in moving liquor. Floating the Galliano on top makes for a nice spicy vanilla aroma for the customer to soak up before having any of the beverage touch their lips. Any Wallbanger is characterized by this liqueur topper. Finish the drink with an orange slice garnish, or burnt orange rind for a little added flash. Galliano is one of those tasty liqueurs we chat about in our bartender training course.